Starting an online store is easier than ever. Yet, many synagogues have not jumped onboard the eCommerce revolution. Is it time rethink that strategy? The revenue raised by your gift shop supports critical programming, but most stores are only open for a few hours a week. Unrestricted by location or time of day, an online store helps you generate revenue even when your in-person store is closed. The idea that an item can only be purchased during a set time or location is out of line with the expectations of modern customers. And, as our shopping habits increasingly value convenience over loyalty to a specific location, your synagogue store risks losing business and support. Consider how key the revenue generated by your gift shop is to your congregation. Why should your members head to another online marketplace to purchase a mezuzah, when they can go to your website? No matter how much your congregants patronize your in-house gift shop, an online store raises revenue and offers more access to your merchandise. Getting started may feel daunting, but it’s easier than you think. The technology powering eCommerce has radically improved in recent years. If you can edit a website using a CMS like WordPress, then you can definitely run an online store. No technology background required. We use WooCommerce, one of the most popular eCommerce solutions. By providing a seamless integration with WordPress, it simply becomes another feature on your website. Check out Design a Mezuzah to see WooCommerce in action. It’s easy to envision your members heading to your website to purchase items, but an online gift shop also holds great promise for those unaffiliated with your congregation – or really any Jewish community. Not everyone is comfortable entering an unfamiliar building for the first time. In an area with a small Jewish population, your website can become the go-to Judaica provider. An online store isn’t meant to be a replacement for your in-house gift shop. Much like how your website is a virtual extension of your congregation, an online store serves the same purpose. And, considering how limited synagogue gift store hours can be, it’s surprising how few congregations allow customers to purchase goods online. The days of asking your members to “send you an email to set up an appointment” or “calling the office for more information” are over. By supplementing your in-house store with a virtual storefront, you are providing your members with a level of comfort and shopping convenience that they have come to expect. eCommerce is booming. It’s time for synagogues to jump onboard. 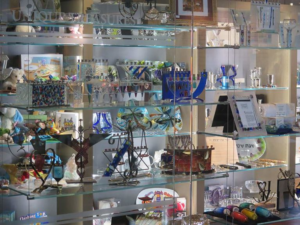 You always encourage your members to check out your gift store before purchasing Judaica else. Opening online marketplace makes it much easier for your members to follow your advice. Considering starting an online store, but don’t know where to begin? Be in touch and let us guide you through the process. We understand the needs of Jewish organizations and are here to help your community thrive online.